Southern Nevada is thriving and continues to showcase its unique and powerful value propositions for businesses. Low operating costs, low regulation, and high quality of life continue to set our market apart and fuel the growth of high-value jobs, the rise of new industries and a stronger workforce. Over the past year – along with our partners – we’ve turned these advantages into big wins for the LVGEA and the state of Nevada, which is leading the nation in job creation. Furthermore, employment is at an all-time high and wages and income are increasing, so it’s no wonder that Nevada ranks at the top of the American Dream Index. Major investments and expansions are on the horizon, and we’ve also seen the exciting emergence of professional sports in Las Vegas that is further diversifying our tourism and hospitality industries, as well as complimenting the vibrant amenities the region has to offer. In this Perspective Update newsletter, you’ll find an update from the Las Vegas Convention and Visitors Authority, a survey of Southern Nevada’s attitudes towards our business climate and an economic update from Applied Analysis. Tourism is and always will be the primary economic engine that propels Southern Nevada forward. And this key piece not only makes us the economic envy of the region, it will lead us into future economic growth. The Las Vegas Global Economic Alliance (LVGEA) has been working hard to attract new business to Southern Nevada and diversify our economy. Their work is critically important to expanding the economic base of our community. It helps to expand our economy, which in turn will also help us to better withstand any economic downturns in the future. The success of any economic development agency is the attractiveness of a community to potential business investors. Business leaders and entrepreneurs look at a number of criteria when determining where to locate or move their company. City’s looking to continue to expand and diversify their economies need to have various business friendly elements they can point out that are attractive to both conducting business and providing an appropriate lifestyle for the company’s employees. They need to have an economic edge to compete. Southern Nevada has a number of key elements that are attractive to new companies, which make us a serious competitor in the southwest. And it is due to the success of our tourism industry that many of these attributes exist. Because of the tourism industry, Nevada has no state income tax,very minimal corporate tax, and tremendous amenities for our residents to take advantage of in the destination. Recent research by Applied Analysis shows that without the tourism industry, every household in Southern Nevada would pay an additional $2,700 per year in taxes. The average property tax bill would double without the contributions of the tourism sector and the sales tax would nearly double. Fortunately, for business prospects and residents alike, the tourism industry’s $2 billion contribution to public coffers does exist. The tourism industry also creates significant revenue for both education and infrastructure, more key elements for the attraction of new business. The room tax that visitors pay when they stay in our resorts has evolved over the years to the benefit of the community. More than one-third of the room tax generated goes to the Clark County School District for school construction and repair and to the State of Nevada Education Fund for teacher salaries and other programs. About 10 percent goes to Clark County and the State of Nevada for transportation improvements and 12 percent goes back to local jurisdictions who typically invest it in recreational facilities and events. All of this investment from the tourism industry helps to create a low tax, low cost of living environment and shows our community’s investments in infrastructure and education to the benefit of company’s considering locating in Southern Nevada. All of this makes us an economically competitive city in the region and helps to sell Las Vegas as a great place to do business. The Las Vegas Convention and Visitors Authority is proud to partner with the LVGEA to help promote Las Vegas as a great place to locate a business. Our resort community strongly supports the continued diversification of our economy. The industry offers a great base for diversifying not only outside of the sector, but also to attract companies that supply the sector. The Las Vegas Perspective quarterly survey examined opinions and attitudes of the Southern Nevada workforce testing sentiments around our region’s economy. This web-based survey was commissioned by Las Vegas Global Economic Alliance and conducted between February 27, 2018 and March 7, 2018. 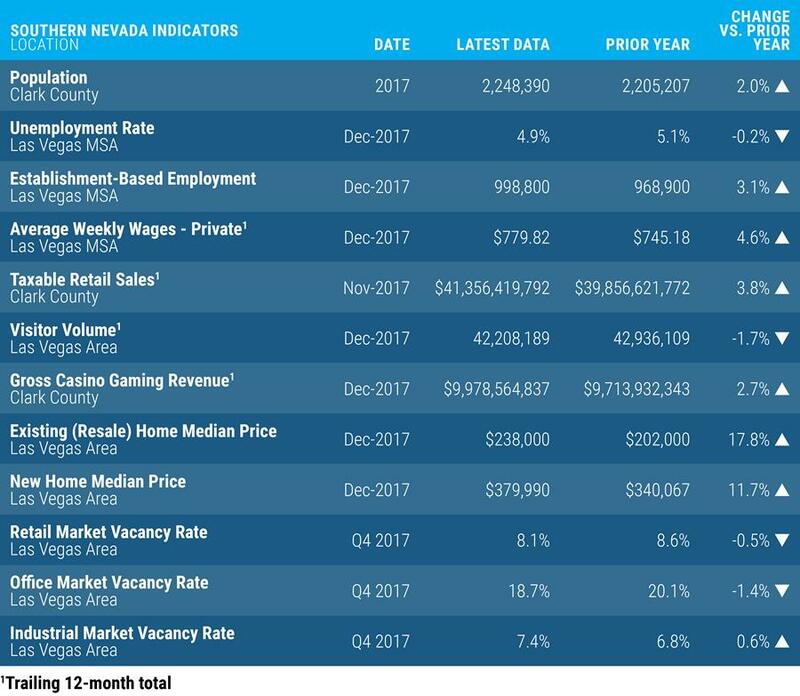 The Southern Nevada economy continued to exhibit strong growth through the final months of 2017, with a number of indicators posting positive performances. The official population estimates for 2017 were released by Clark County, and they included a 2.0 percent gain to 2.25 million. The pace of resident expansion was impressive – translating into nearly five new residents every hour of every day during the past year. Total employment in the region reached a new peak of 998,800 in December 2017, a year-over-year increase of 3.1 percent. The employment growth rate was twice the 1.5 percent national job growth rate. Total private average weekly wages also climbed over the year, rising 4.6 percent from $745.18 to $779.82 in Southern Nevada. Southern Nevada added 29,900 jobs in 2017, with employment gains spread over a number of industries. With the rapidly rising regional population creating new demand for residential and commercial projects, the construction industry experienced the fastest annual growth (+18.3 percent) and added 10,800 jobs over the year. Other sectors with employment gains during the year included professional and business services with 5,300 jobs (+3.9 percent), education and health services with 4,400 jobs (+4.6 percent), trade, transportation, and utilities growing by 1,900 jobs (+1.1 percent), and financial services adding 1,400 jobs (+2.9 percent). A small decline in leisure and hospitality employment (-0.2 percent) echoed the broader trend in tourism over the past year, as year-end Las Vegas visitation dropped 1.7 percent from 42.9 million in 2016 to 42.2 million in 2017. It is worth noting major renovations such as those at Palace Station and Palms may be impacting selected hospitality data points. Even with the dip in visitation, other indicators such as gross gaming revenue, taxable retail sales and McCarran International Airport passenger counts suggest stability in overall demand. Another positive for the year was record convention attendance, which grew by 5.3 percent to an all-time high of 6.6 million. An expanding resident base contributed to incremental demand for housing; the median prices for existing and new homes rose, ending the year at post-recession highs. The median existing home closing price in December 2017 was $238,000, up 17.8 percent over the prior year, and the median new home closing price rose 11.7 percent to $379,990 over the same period. The existing home market continued to report tight supply, with effective inventory dropping to 1.4 months in December 2017. Homebuilders have responded to rising demand, and the number of new home permits issued in the for-sale market in 2017 climbed to 9,740, a 10.7 percent increase over 2016 and the highest year-end total since 2007. Several major investments that are either underway or close to groundbreaking within the tourism industry bode well for the region’s most-important sector. During the last couple of months, construction began on the $1.9 billion Las Vegas Stadium, the $1.4 billion Las Vegas Convention Center expansion and the $150 million Las Vegas Ballpark. Additionally, plans to complete the Fontainebleau and rebrand it as The Drew Las Vegas were recently unveiled, marking a significant development for the north end of the Las Vegas Strip. Other non-tourism and infrastructure investments taking place include Switch’s continued expansion, Clark County park upgrades, Project Neon and other roadway infrastructure investments – just to name a few. These developments, solid underlying conditions and overall consumer confidence are poised to keep Southern Nevada on the positive growth trajectory that it has enjoyed over the past several years.